James P. Leaf mausoleum, 1949. Beaver Cemetery. This blogger has spent a lot of time in the boneyard. 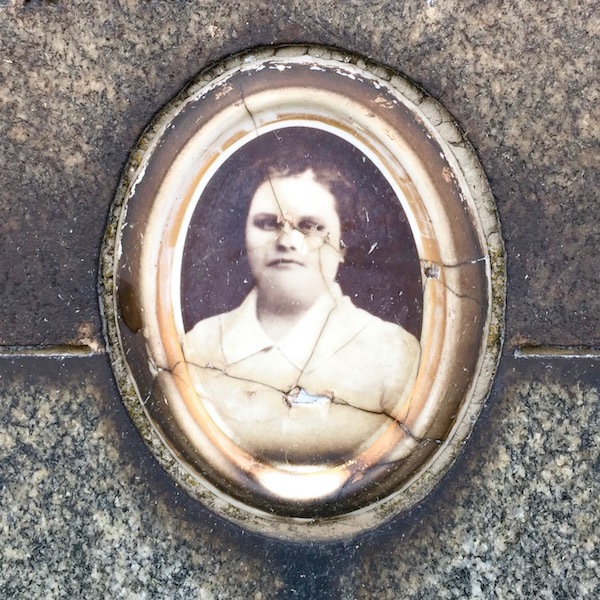 So much time, we dare say, that we’ve hung out more than some cemeteries’ (newer) full-time residents. 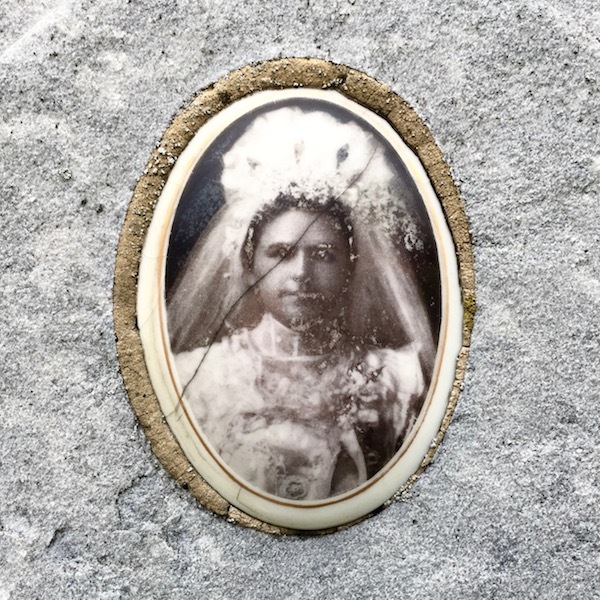 To visit one is a whole enchilada experience: you get to be outside in the introvert’s version of Kennywood–usually alone, in near silence, on beautifully-cared-for grounds that feel like a wild city park. Often there are the deer and crows and opossums to back it up. 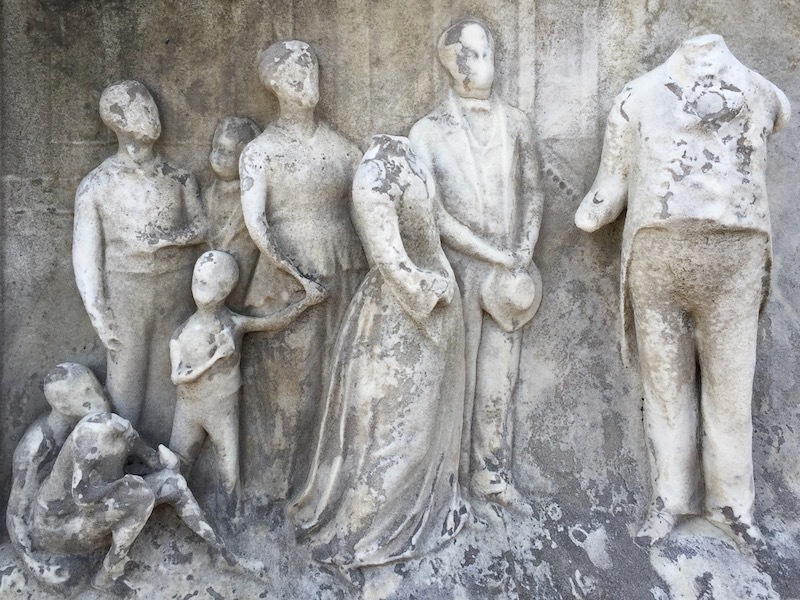 But it’s a park alive (ironically) with stories and history, carved images and statuary. 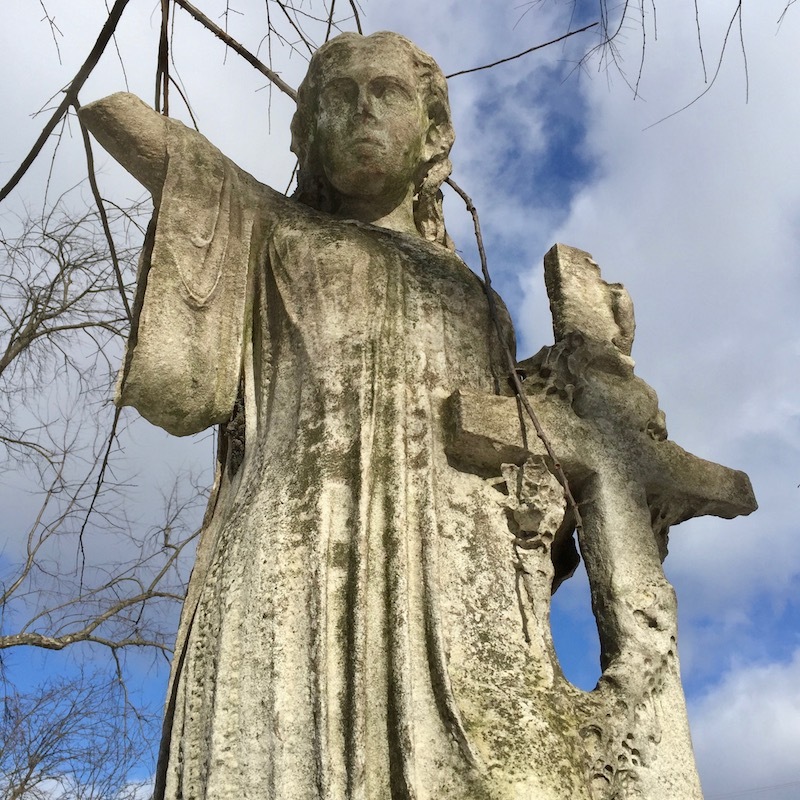 Any cemetery has way too much to take in for just a single visit. Have you seen the back? 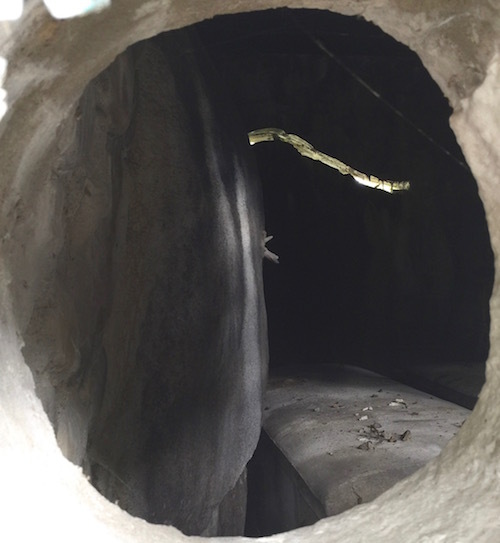 Large boulders embedded in the Leaf mausoleum. What these hallowed grounds don’t tend to feature so often is the touch of the human hand. 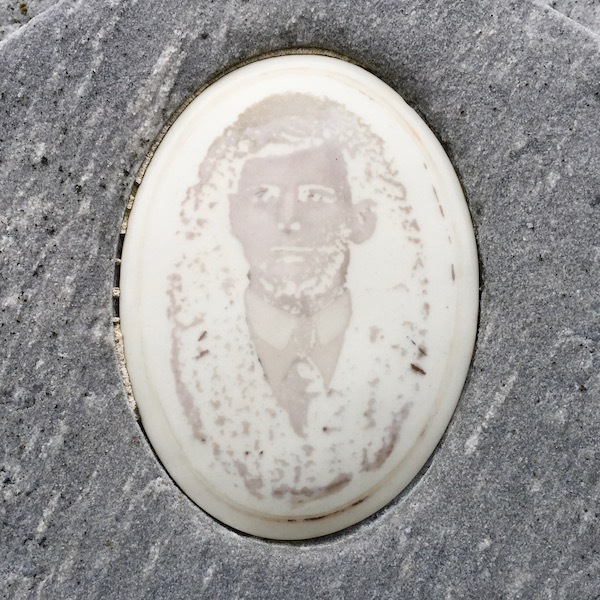 Typically, gravestones are professionally-cut, perfectly-engraved, production line affairs. They’re marvels of precision stone-cutting and restrained grace, symmetry and classical iconography. 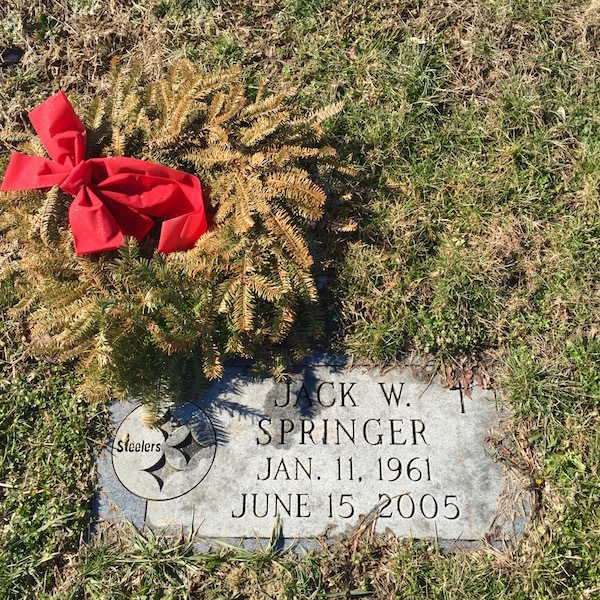 Rarely, however, does one encounter a grave marker that was hand made by the grieving family. 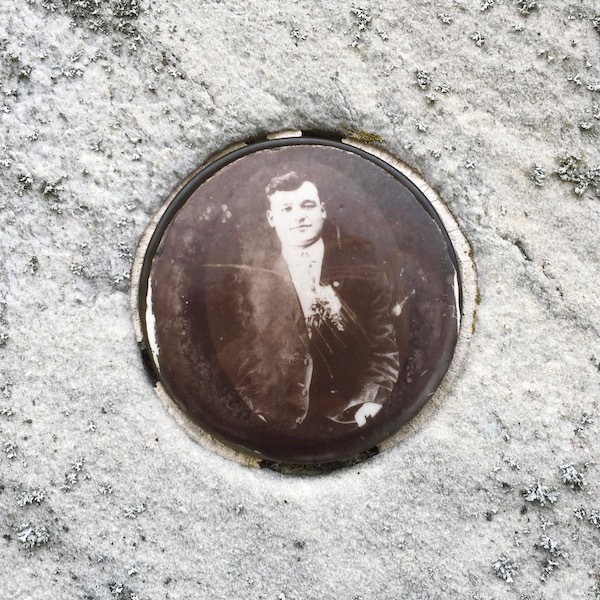 [An obvious exception to this is the “DIY gravestones of Highwood Cemetery” (Pittsburgh Orbit, Oct. 30 and Nov. 1, 2015).] 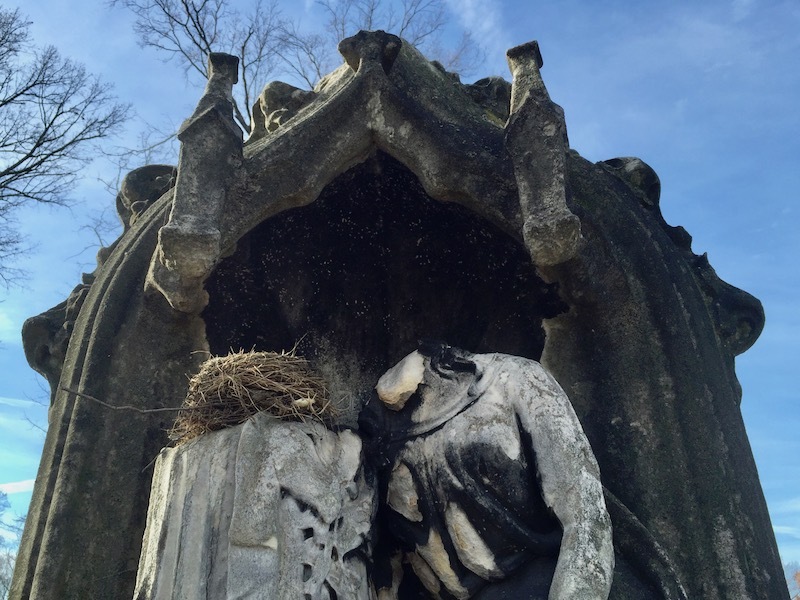 It is especially rare to see a stone or tomb that looks like his or her bats-in-the-belfry aunt or brown bottle flu uncle would have built it. 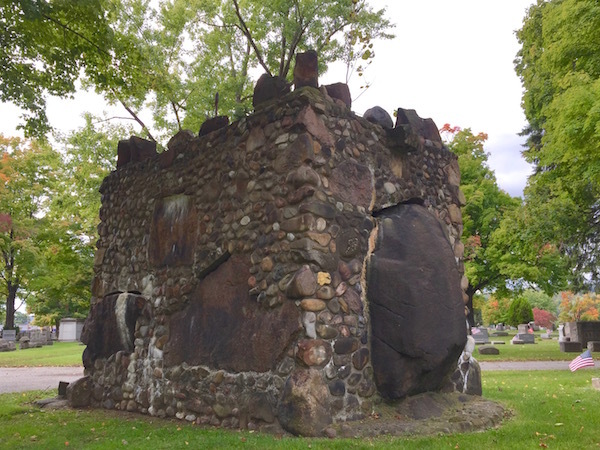 That, however, is exactly what Beaver Cemetery’s James P. Leaf mausoleum looks like. 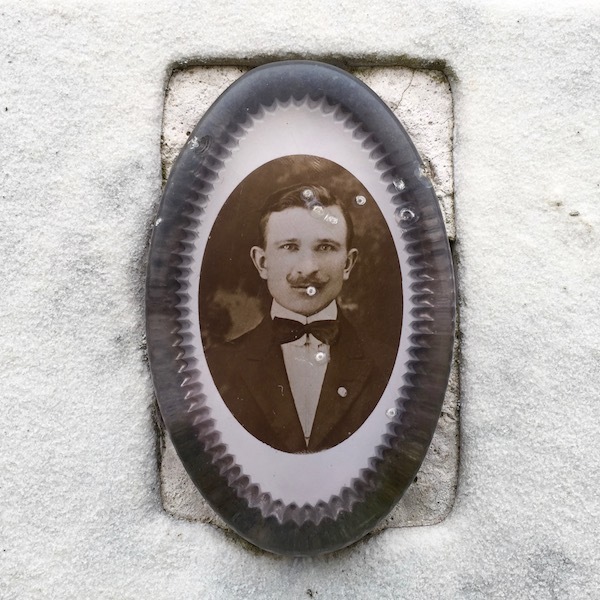 At approximately the size of a one-car alley garage, it’s definitely the right scale for your typical double-crypt couple’s tomb–but it sure doesn’t look like one. There are none of the straight lines, white stone, or classical features we normally see. Mr. Leaf didn’t even receive the customary stained glass rear windows like we peeked in on in Allegheny Cemetery. Instead, the monument has clearly been constructed by hand, from an oddball collection of irregular stones. These range from the size of a cantaloupe to huge boulders that would crush a house in their falling path. 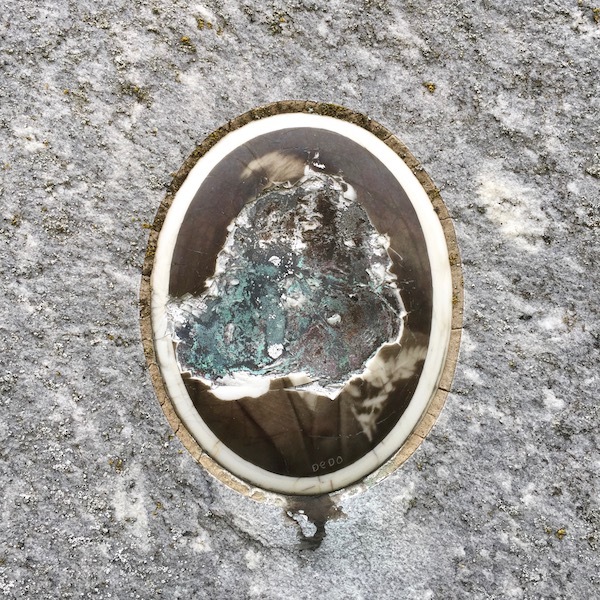 One of these massive rocks has been set to entirely block the front entrance to the tomb, leaving only an oxidized copper Leaf nameplate visible awkwardly above. Water-smoothed river pebbles have been used to create decorative features within the mortar walls and vertically-places stones sit on top to resemble crude castle battlements. 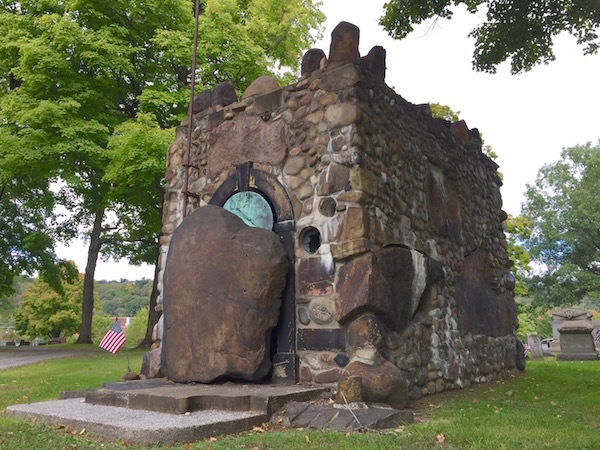 There is a maybe too-good-to-be-true story that the mausoleum was built with stones pulled from each of Pennsylvania’s 67 counties that appears in several sources, all unsubstantiated. 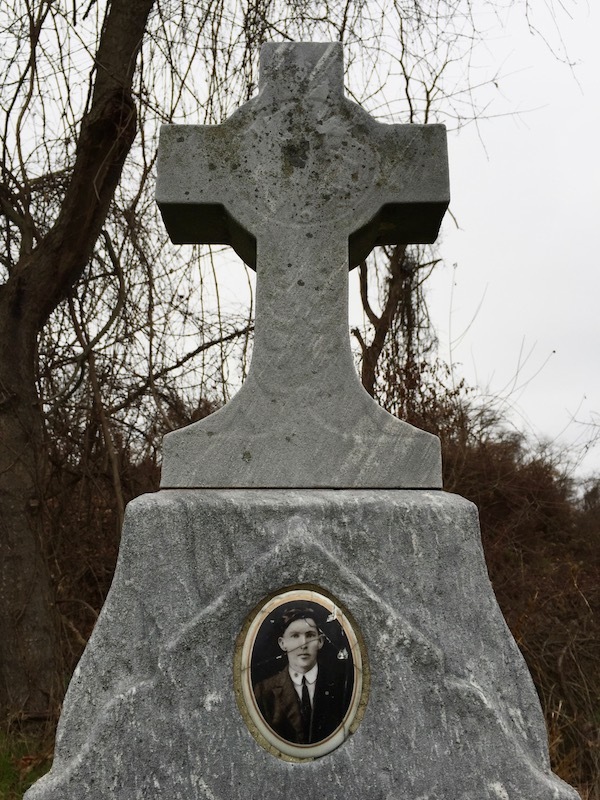 James Pinney Leaf (1866-1949) seems an unlikely soul to spend eternity in such a ramshackle final resting place. 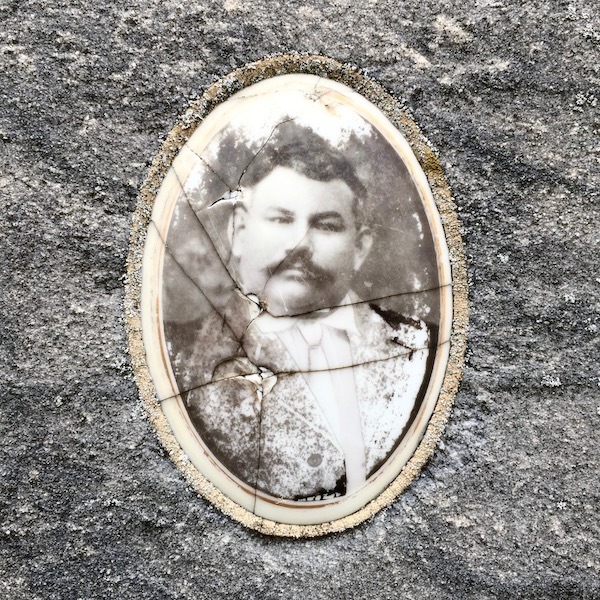 The son of an engineer, Leaf followed in his father’s footsteps, earning a degree in engineering, serving in the U.S. Army Corps of Engineers during World War I, and working on projects and surveys in Rochester, PA, the Ohio canals, Pymatuning Reservoir, on Lake Erie, and along the Ohio River. So how did a lifelong builder and engineer end up in a cattywumpus backyard barbeque of a crypt like this one? There’s got to be a great explanation here. Spoiler Alert: We don’t know! The Orbit sat on this story for an entire year, dug into the books with the crew at the Carnegie Library’s Pennsylvania Room, consulted professional archivists, talked to Beaver Cemetery staff, and … Zilch. Goose egg. Bubkes. “Nothing burger”. 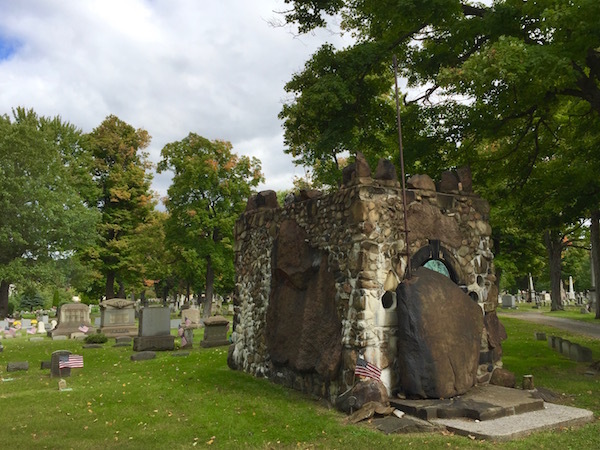 Who James P. Leaf was is well documented–Hillman Library has a huge collection of family papers–but it’s a total mystery how such an esteemed veteran, builder, and prominent community member ended up with this pile-of-rocks mausoleum. One of these memorials is not like the rest. 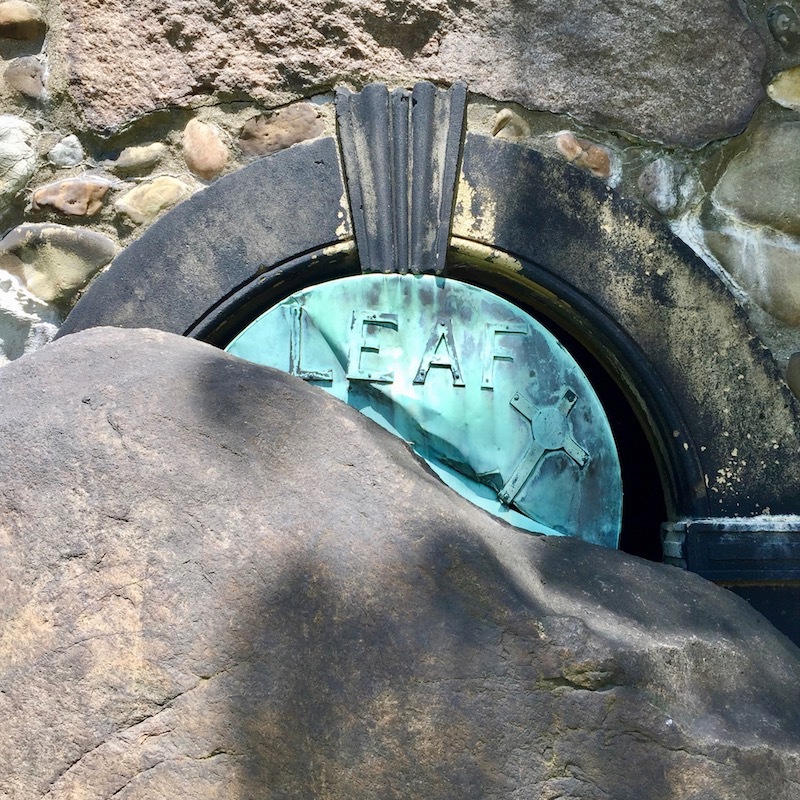 Leaf mausoleum, Beaver Cemetery. 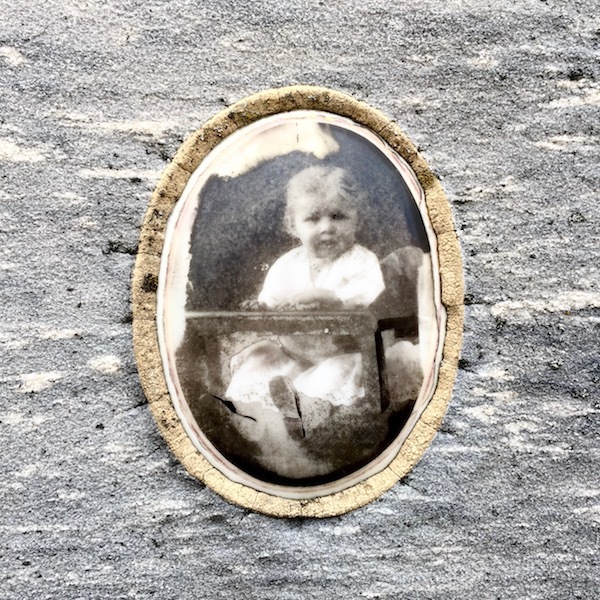 It was a rough week–emotionally and physically. Nobody wants to hear about all that, but you’ll no doubt respect the need to just move on and let a mystery be its own mysterious self. Maybe by having this story out there someone who actually knows what’s up with the Leaf tomb can enlighten us and we can finally set the record straight. Currently, we’re in the apex of leaf-changing glory. 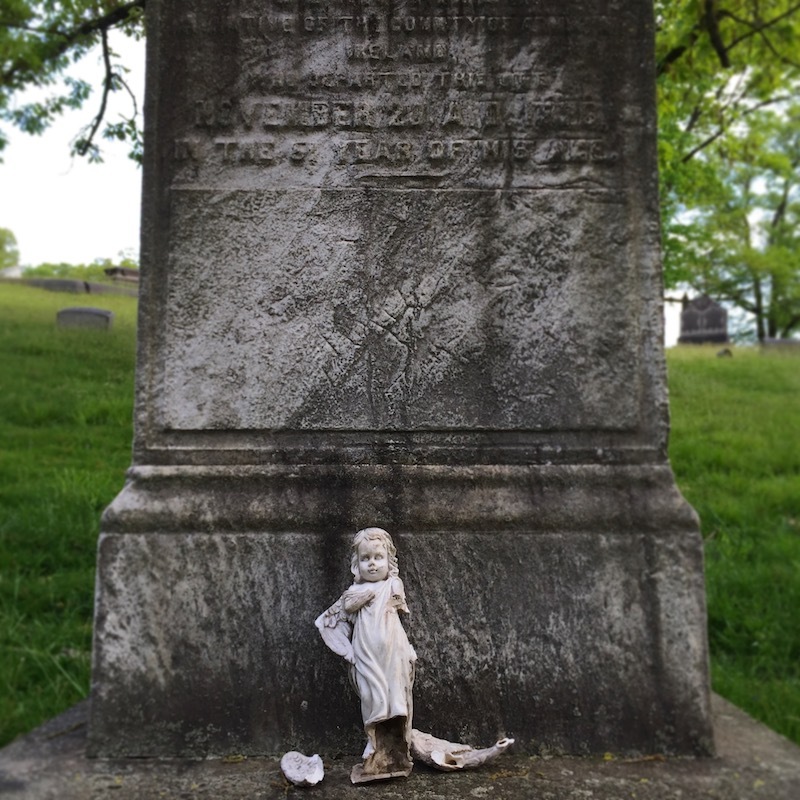 If you’re looking for a destination to get your fall colors on, you could do a lot worse than the fun drive out Route 65, past Punks Ice Cream and the murals of the Sewickley Speakeasy, to lovely little Beaver Cemetery. See what you can find out for ol’ Orbit, will you? University of Pittsburgh Library System, Leaf family papers. 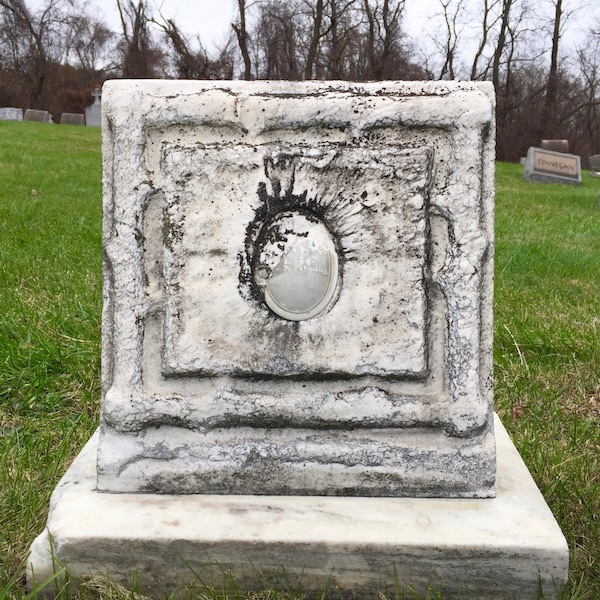 The simple grave marker is nothing out of the ordinary. Gently curved and smoothly hewn, the stone is a standard off-the-shelf/out-of-the-catalog mid-century model we’ve seen hundreds–perhaps thousands–of times in different plots over the years. 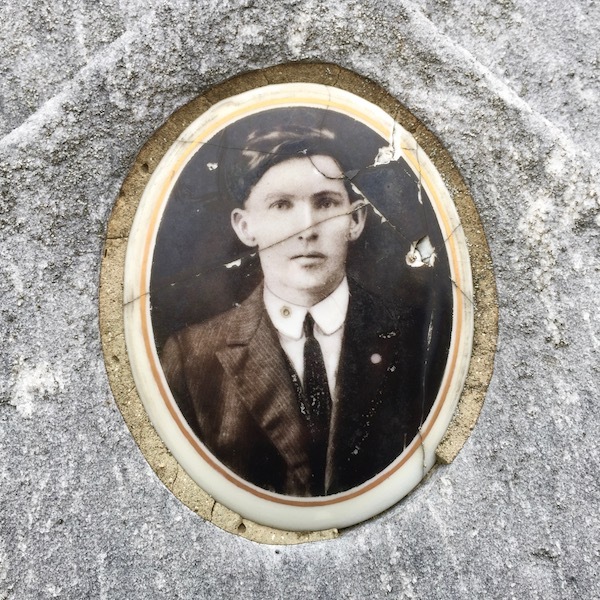 About the size of a microwave oven, it has raised block letters on its face which detail only the most basic facts about the deceased: Frederick W. Zinsser, 1878-1942, Father. 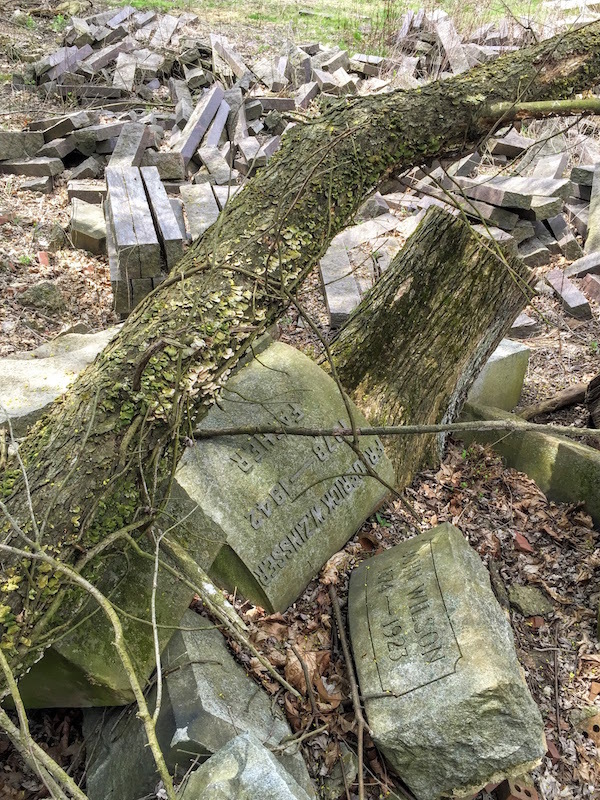 What’s strange about Frederick Zinsser’s headstone is how it arrived in its current position–upside-down, squashed between two felled trees, in a hidden, barren spot just outside the cemetery’s otherwise beautifully-groomed and spectacularly-scenic acres of visiting space. 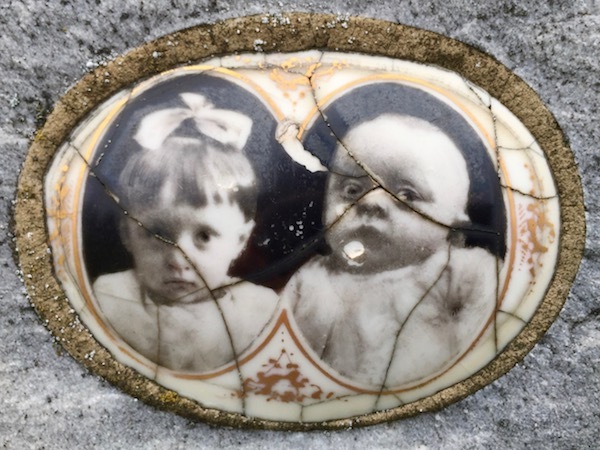 Oh, and why is it surrounded by dozens of other gravestones and stray cemetery infrastructure that appear casually tossed in the dirt like children’s playthings at the call for dinner? We’re not talking about just a few stones–a pile here and a pile there. No, the graveyard for gravestones is extensive. 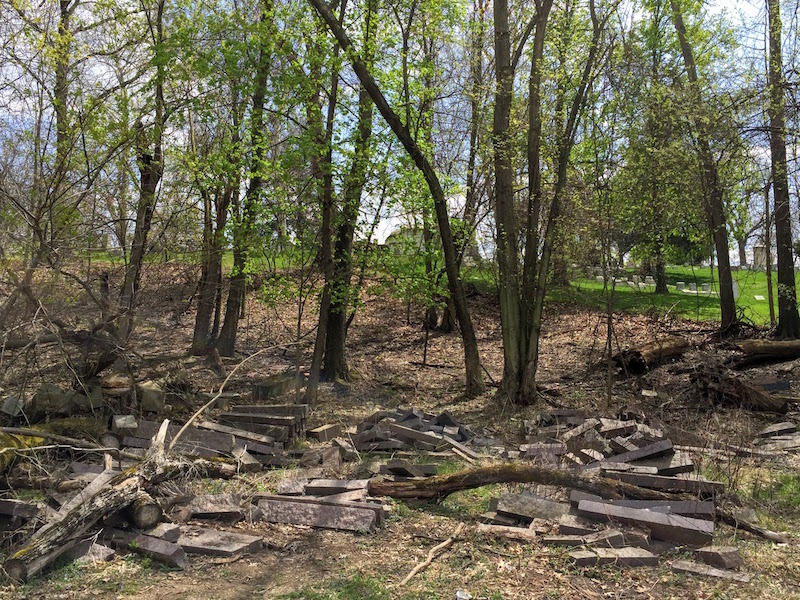 It’s a big, basin-shaped open area just downhill from the older side of the cemetery. By now–in early May–you probably wouldn’t even notice it. 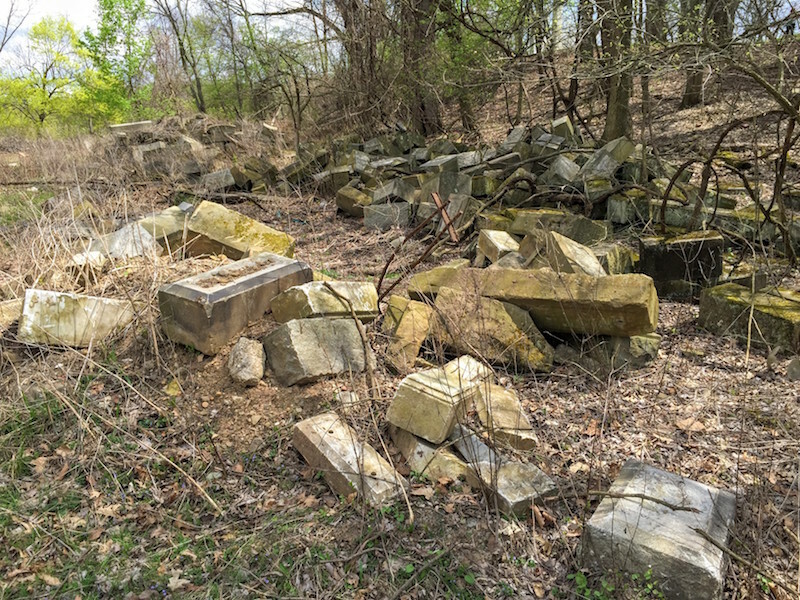 But when we visited on Easter Sunday the thin shroud of young trees hadn’t yet fully sprouted all its leaves, allowing this unsightly broom closet of quickly-tossed granite to be impressively available to the passer-by. 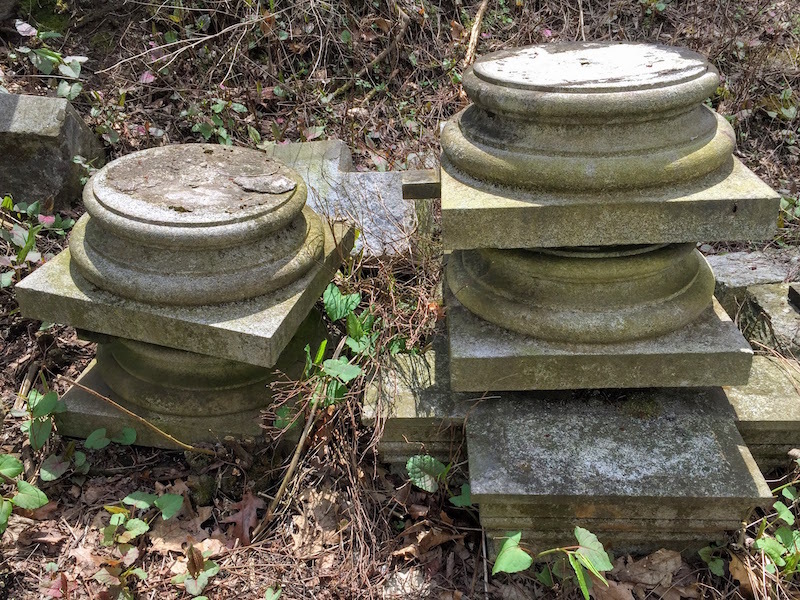 This graveyard-within-a-graveyard contains piles and not-so-neatly-stacked collections of granite monument trimmings, grave edging, foundations, pedestal bases, supporting structural elements, and a least a couple full cemetery buildings, deconstructed and laid out like parts to-be-assembled in an Ikea box. The stones didn’t just get dropped-off yesterday. They’ve got several years worth of viney overgrowth climbing in, on, and around the various pieces; a number of fall seasons’ downed leaves mulching their bases. 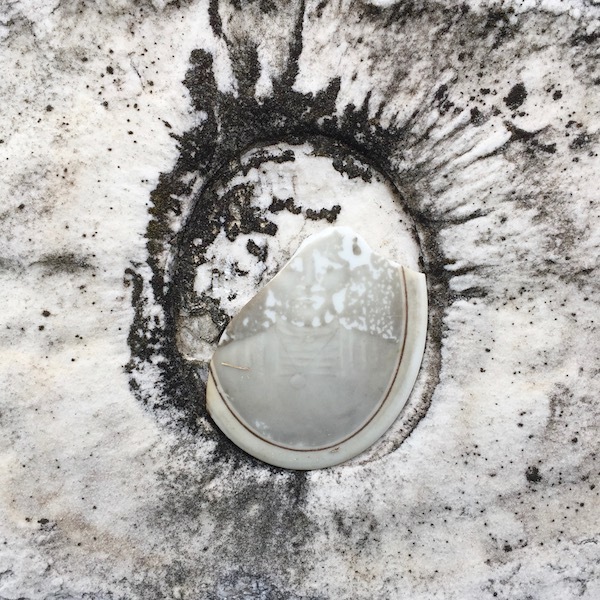 In the head-heart continuum, we tend to want the cemetery to be the final place where one may rest in peace…forever. We also know that nothing actually lasts that long. Most of the time, for good or bad, we won’t have the chance to confront that reality. 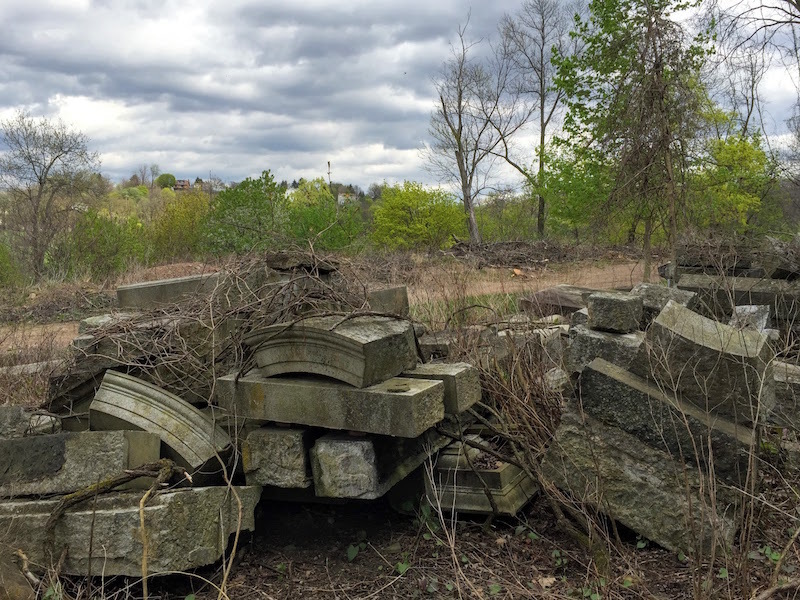 But seeing dozens of (literal) set-in-stone, lifetime memorials uprooted from their primary locations and dumped in a strange public-private boneyard junkyard makes it all the more obvious. 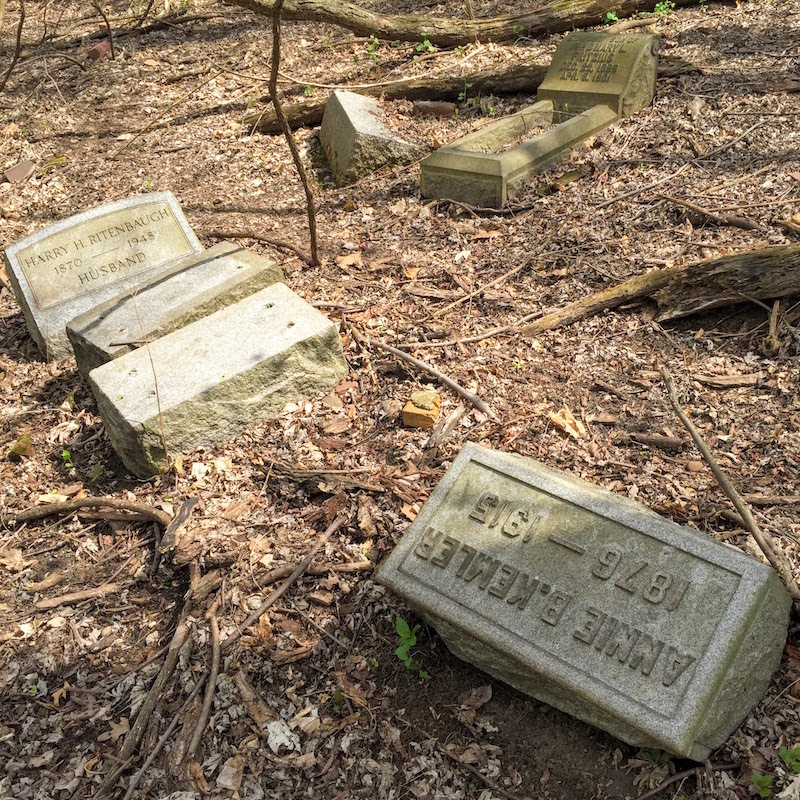 We don’t know why these gravestones were uprooted or why the cemetery has dumped them so casually right in the middle of the property. The Orbit maintains a strict “don’t ask, don’t tell” policy toward clarifying these matters, preferring to speculate and wonder over the cruel realities of truth. That said, it seems like a strange business move for the marketing side of the cemetery. Will customers really want to buy that plot seeing the downed markers so nearby? 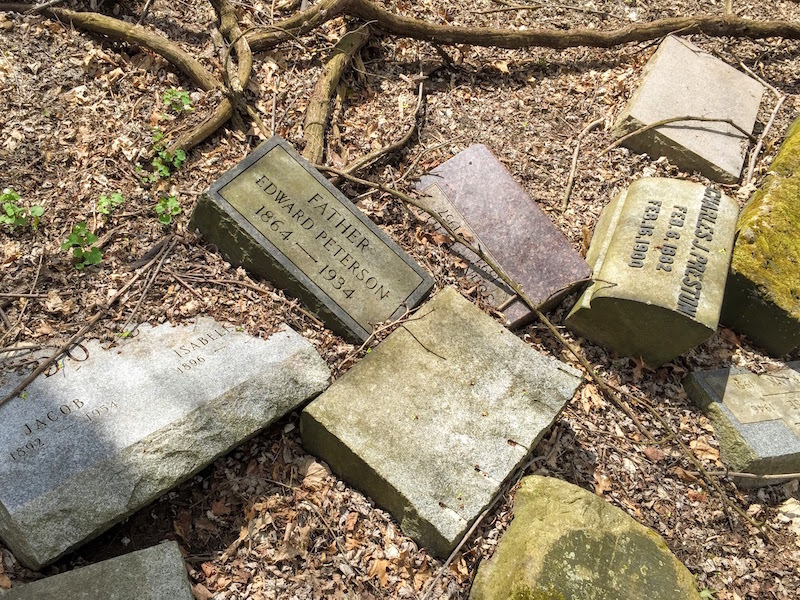 And–assuming there are legitimate, practical reasons for the markers’ removal–why can’t the grounds crew at least put the retired stone in some kind of relative respectful order? 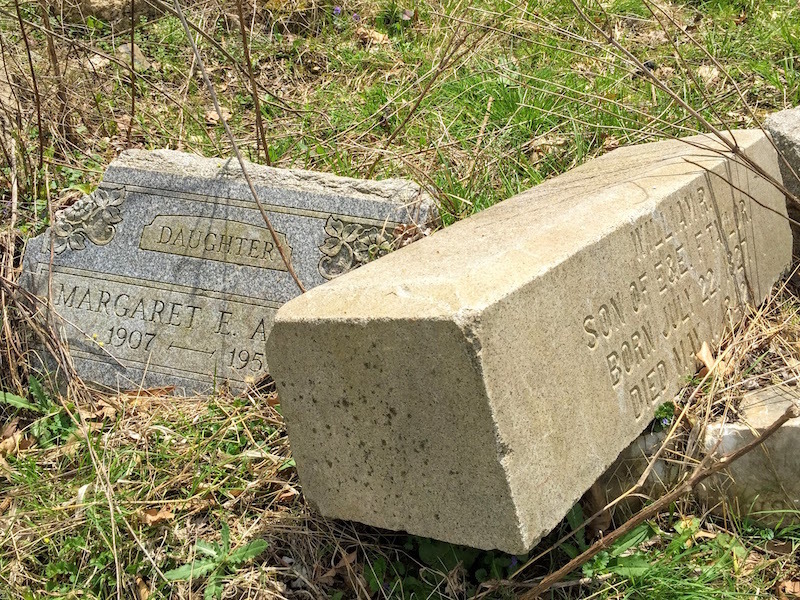 We imagine the current market for used gravestones is pretty low. 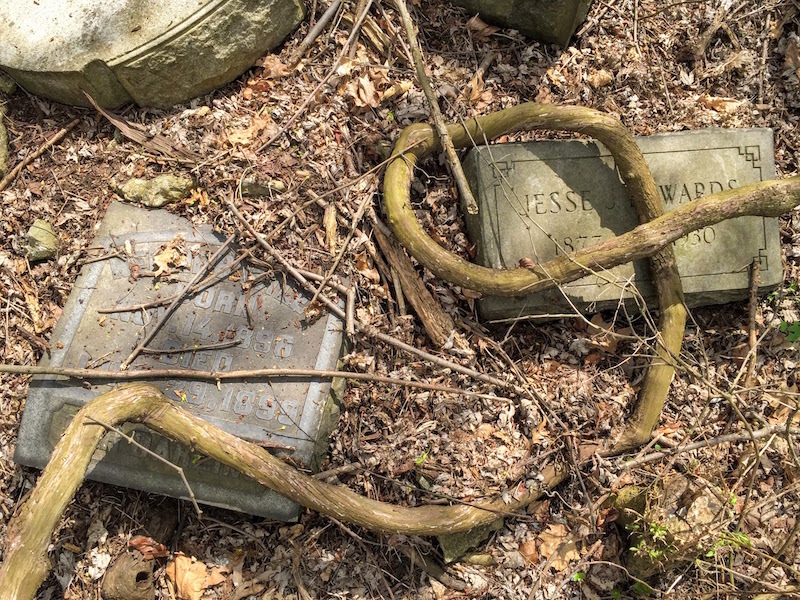 That said, there simply must be more interesting uses for this substantial supply of unique historic, hand-cut, and incredibly-durable pieces than just sweeping them under the cemetery’s rug of fallen leaves. 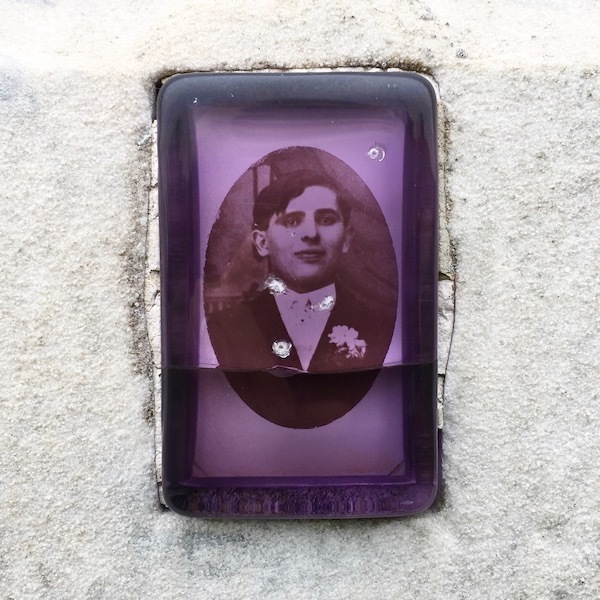 The stockpile could absolutely be turned loose for artists to work with, used to decorate public spaces around the city, or recycled by monument makers into new graves. 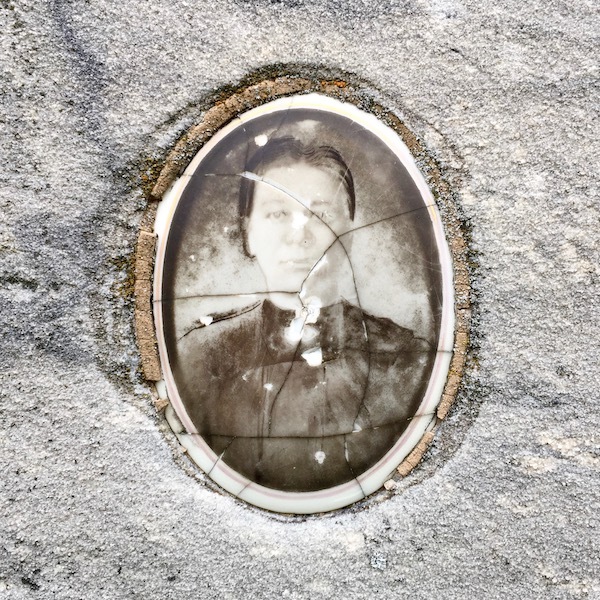 Speaking from experience, those of us who haunt the cemetery and ponder how the whole thing works would appreciate an educational display explaining how and why all these elements ended up displaced from the humans they once memorialized. For our purposes, however, it’s a kind of weird disaster cool just as it is. The area evokes something between an Easterner’s imagination of the catastrophic wreckage following a big earthquake and the post-armageddon chaos that seems more likely every day. 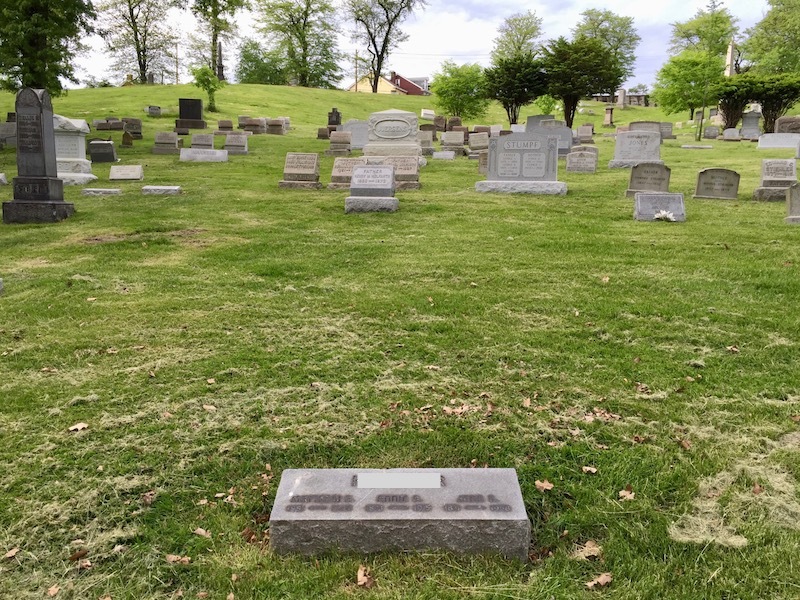 In zombie-obsessed Pittsburgh, we can picture the living dead rising from their crypts and casually tossing headstones like beach balls at summer concert. Perhaps the whole thing is social commentary: in just a couple months, The North Side can look forward to a similar scene in the wake of Kenny Chesney’s inevitable mid-summer return–only we may end up with more dead bodies around Heinz Field. 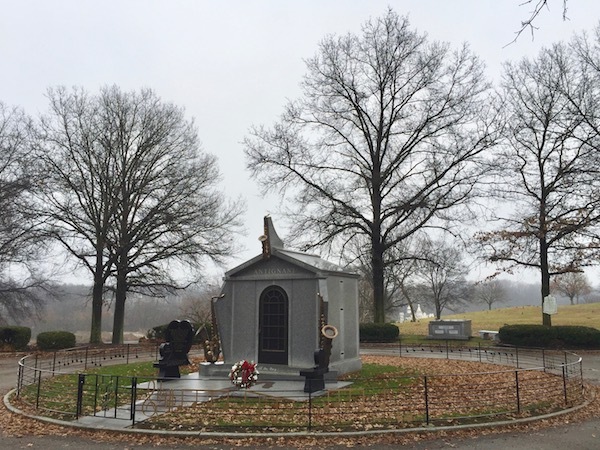 The granite mausoleum stands alone inside a marquee plot surrounded by a thin circular cemetery road. A long stretch of musical staff wraps the perimeter with twenty-some bars of melody notation spelled-out; vertical fence posts serve double-duty as measure lines. Two six-foot-tall ornamental saxophones flank the doorway; a third marks the crest of the roof. 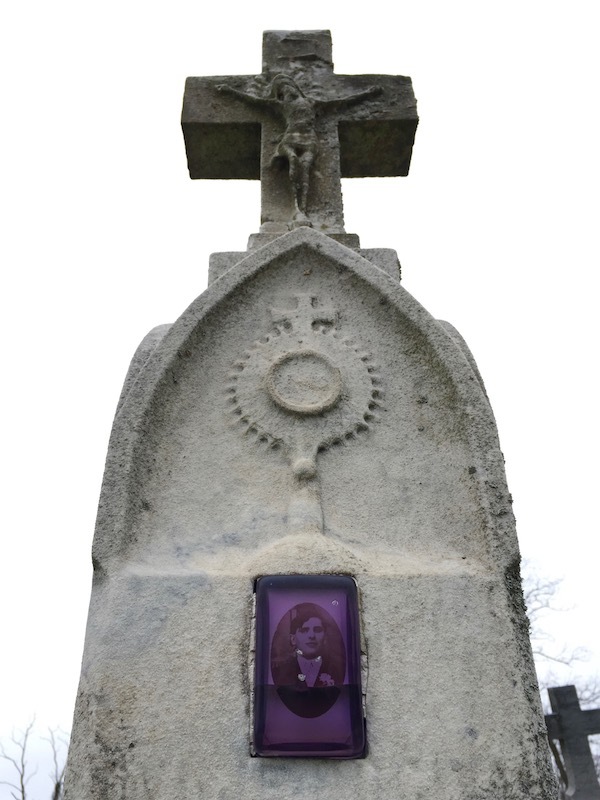 Palm to forehead, one can squint through the gauzy haze inside to the mausoleum’s stained glass window. 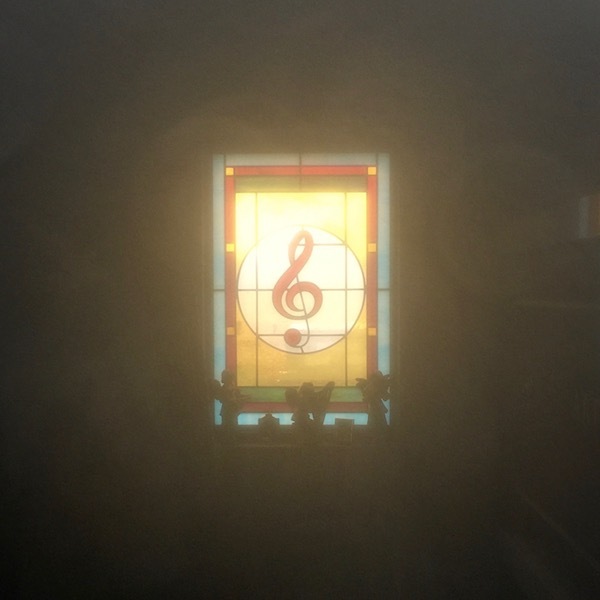 There, a backlit treble clef symbol glows where one might normally expect the image of an angel or flowers. 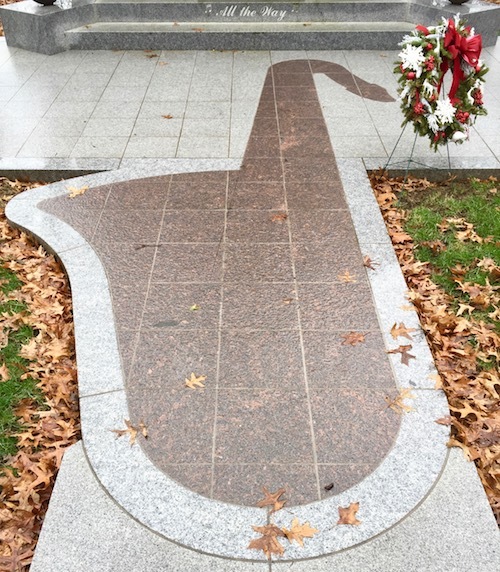 The footpath out front is yet another gigantic saxophone, this one rendered minimally in two dimensions on red-brown granite tile. The entrance step is engraved “All the Way”. All the Way could–and should–be the title of Arthur and Alfreda Antignani‘s bio-pic. The couple lived large in a Hampton hilltop property they built for themselves and named Skyvue Estate. Our story on what remained of that shag-carpeted, double-bedazzled, rhinestone-encrusted, tchotchke-strewn, twenty-four hour party palace and its grounds [Graceland North: The Antignani Estate Sale, 4 Nov. 2015] is one of the most-read Orbit stories of all time. 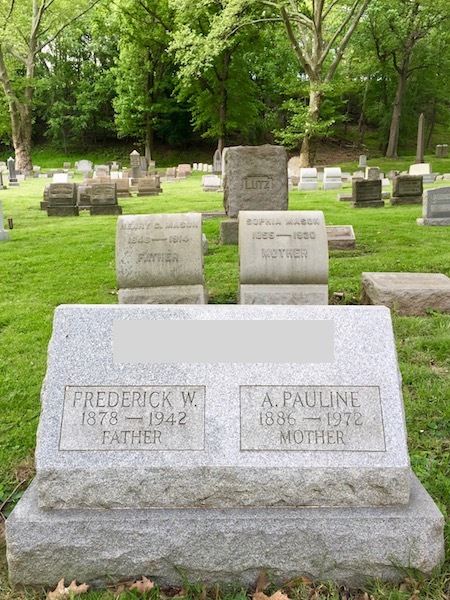 Though the Antignanis have left this particular stage, we thought it was high time to call for an encore and visit this fascinating couple in their final resting place. That the Antignanis loved music should come as no surprise. Every inch of Skyvue Estate–from the guitar-shaped patio to the band of frog figurines jamming on the credenza–confirmed as much. 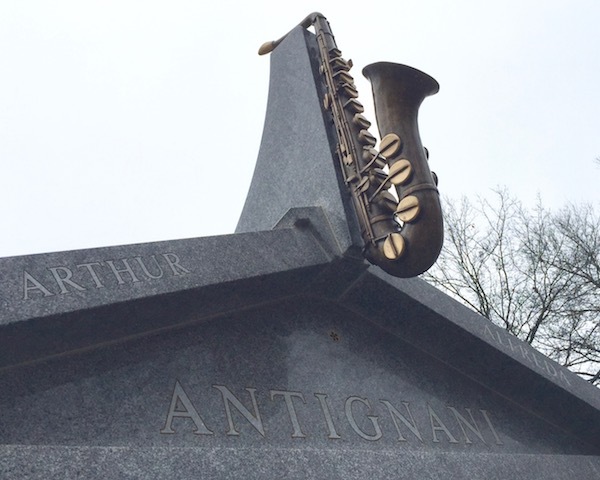 So it is fitting that as Alfreda spent the very the last years of her life designing and planning the memorial, she’d want the imagery of music–especially Arthur’s tenor saxophone–featured prominently. 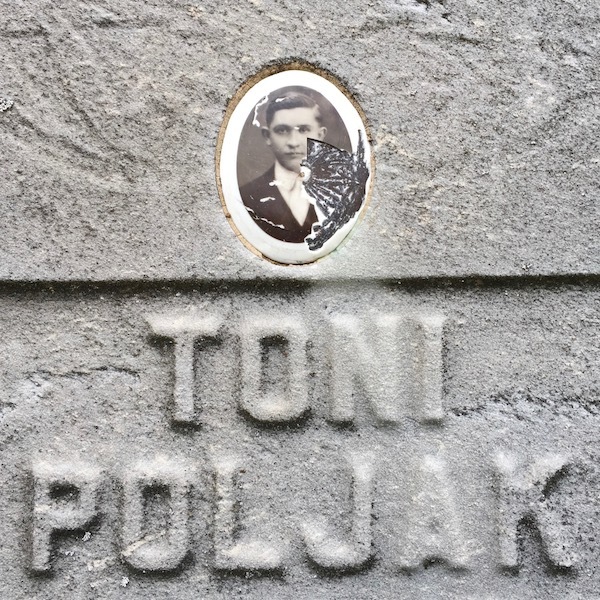 The touch to include actual musical notation on the small fence–as opposed to any old clip art approximation of stray notes on a staff–was an inspired design decision. If you haven’t guessed by now, the melody is, of course, “All the Way”. “All the Way”, the Sammy Cahn/Jimmy Van Heusen standard made famous by Ol’ Blue Eyes (among many others) is a classic tear-jerking ballad of life-long love. It may be a songwriting cliché, but a lyric like “Through the good or lean years, And for all the in between years” speaks not to the eros of so many pop songs and rom coms, but to the pragma and philia of a couple that spent over half a century together in what we can only imagine as one of the great eccentric long run romances of our time. To Arthur and Alfreda Antignani, may you rest in peace, all the way. 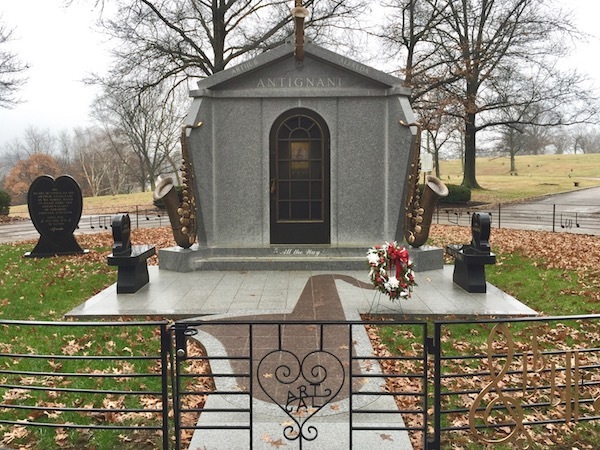 Getting there: The Antignani mausoleum is in Allegheny County Memorial Park, 1600 Duncan Ave., Allison Park. The cemetery has very few above-ground average-sized headstones (possibly none?) 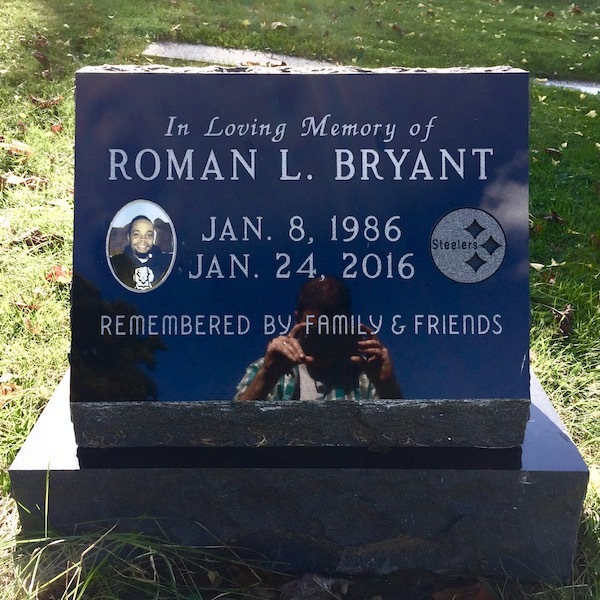 so the handful of large memorials/mausoleums stand out really easily–you won’t miss it. For comparison, see Allegheny Cemetery: Mausoleum Stained Glass, Pittsburgh Orbit, Oct. 12, 2016. 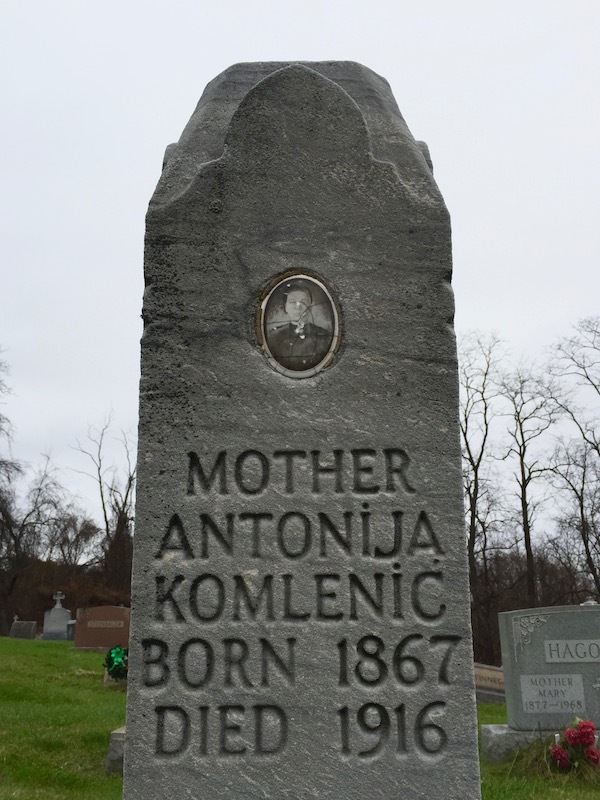 “In life and death, eccentric Hampton couple makes beautiful music together”, TribLive.com, Dec. 5, 2015. The Antignanis were married and 1959 and Arthur died (first) in 2011. In the great Autumn campaign that is each of our lives, we’ll inevitably begin to feel those last seconds of the final game tick off the clock. We can all hope to make it deep into the playoffs–heck, some may even get lucky enough to reach this preposterous metaphor’s Super Bowl. But even with the very best “clock management,” we’re all heading toward a long long off-season in the sky at some point. Forever, the Purple One reminds us, is a mighty long time. It’s likely, though, that The Prince was not thinking about funeral arrangements when he urged us all to “go crazy.” So I’m sure it’s with no small amount of consideration that most folks choose the design and ornament of a gravestone–either for oneself (if he or she likes to plan ahead) or for the loved one the family is burying (more likely?). 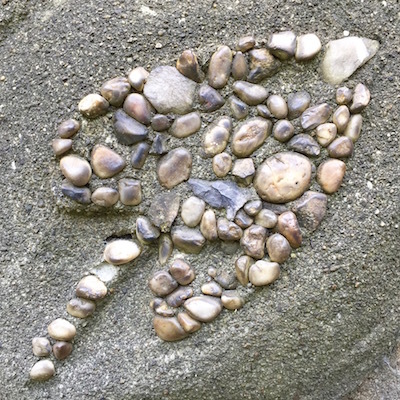 Why, there’s the stone itself, available in any number of shapes, sizes, finishes, and flourishes. 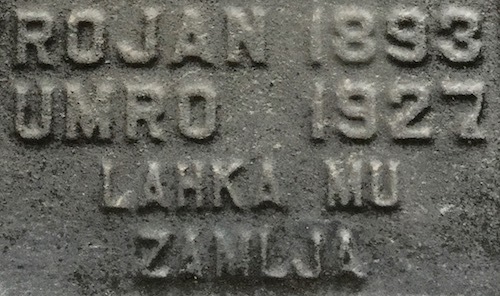 There’s the text–a full name, sometimes with a favorite nickname, birth and death dates*, and then any manner of other possibilities: pithy epitaphs, Bible verses, embedded portraits, etched images both representational (occupations, avocations) and ornamental (flowers, angels, religious insignia). 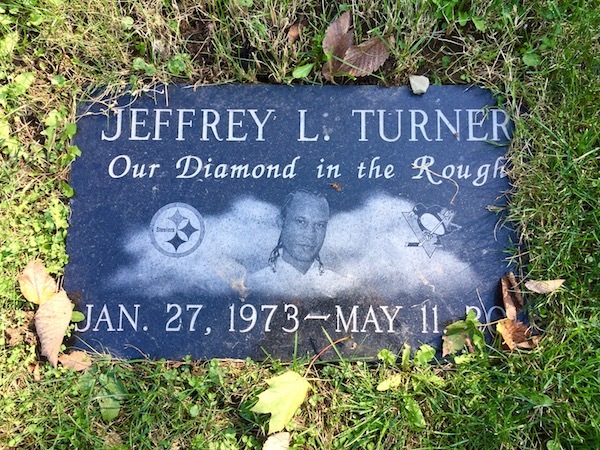 If the deceased happened to champion a particularly well-loved, black-and-gold-hued eleven, chances are maybe better than you’d think that the emblem of said N.F.L. franchise will end up etched into his or her headstone. 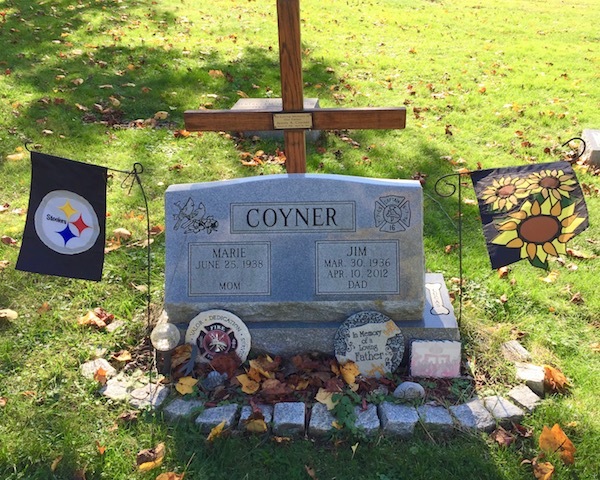 This act of committing and commemorating the deceased to eternity as a devoted Steeler fanatic lets the living know that while still tripping on this mortal coil he or she bled (hopefully not, you know, all the way out) black and gold. It’s a curious choice. Steelers fans would never admit it, but sports franchises are transient things. 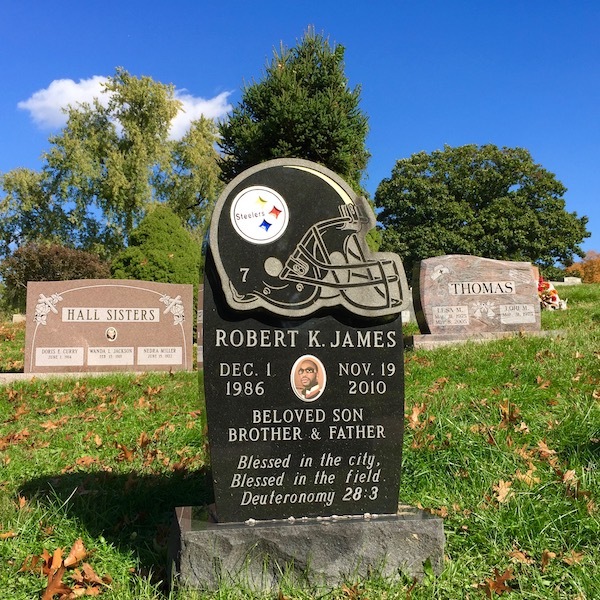 Pittsburgh has been fortunate to never have one of its teams skip town, but we’re only 80-some years into professional football history–there’s still a lot of time for a lot of things to happen. 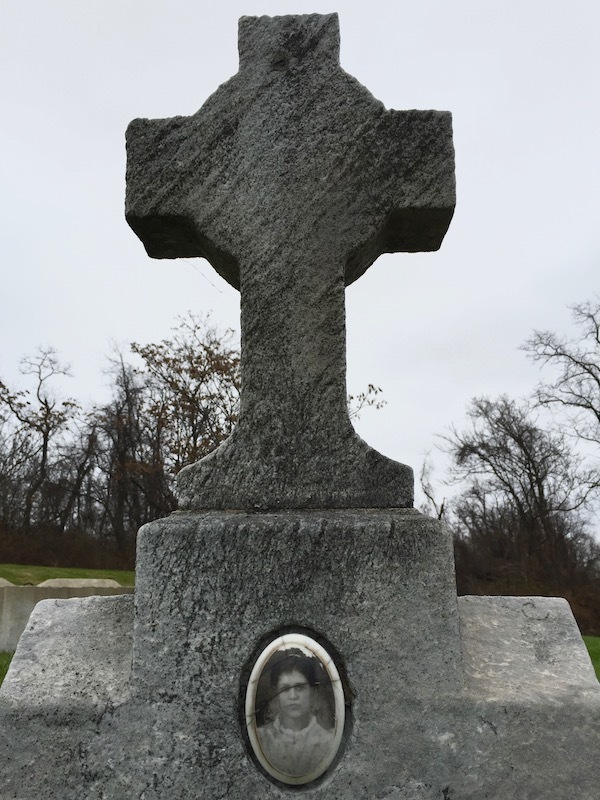 Are there graves in Baltimore or Brooklyn or Hartford with Colts, Dodgers, and Whalers logos carved into them? I doubt it, but only because those moves all happened before the relatively recent phenomena of having one’s passions preserved in stone**. 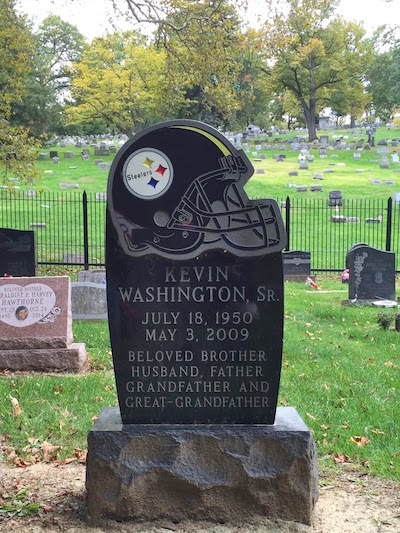 But what about St. Louis–are there fresh graves just set with Rams insignia marking them? Possibly…maybe even probably. What an indignity to give one’s afterlife to a team that just high-tailed it back to Los Angeles. It makes you wonder if this happens everywhere. This blogger can certainly imagine the same level of devotion from fans of the Boston Red Sox or Montreal Canadiens or Green Bay Packers. But what about Cleveland or Cincinnati? 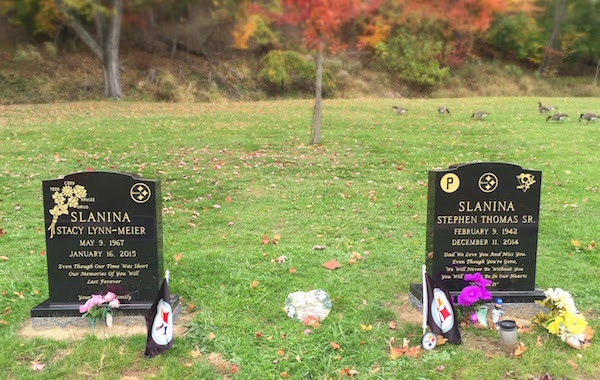 They’ve got their own rabid fans, but are there Browns and Bengals graves? We sure hope not–life on earth following these teams was already Hell, why take that misery with you? What about even more marginal sports territories? 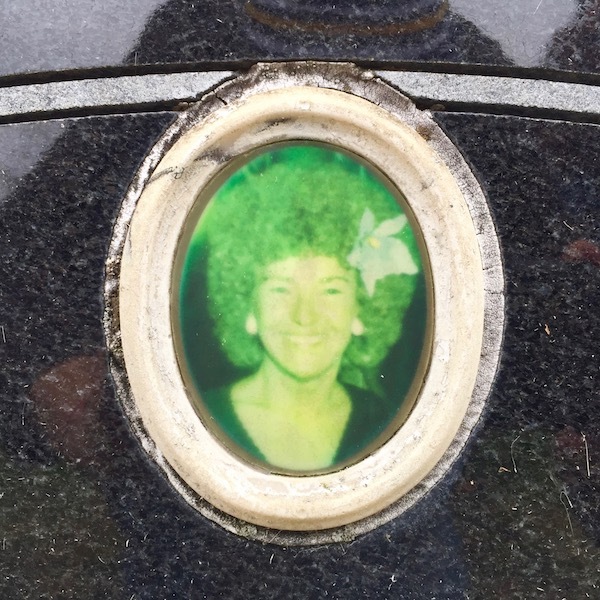 Is there anyone in Seattle or San Jose that cares enough about the Seahawks or the Sharks to tattoo it on a gravestone? Does most of North Carolina, Florida, or Texas even know they have hockey teams? 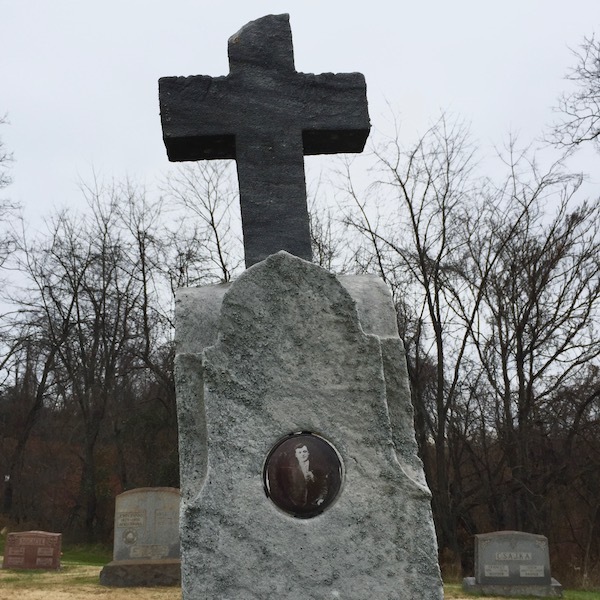 What monument maker could carve the offensive Cleveland Indian or Washington “redskin” into stone in good faith? I don’t even want to look at the terrible Anaheim “mighty duck”, let alone get buried under it. All that said, the good people of Pittsburgh are quite comfortable with this option. It wouldn’t be my choice, but I’m glad it is for some. 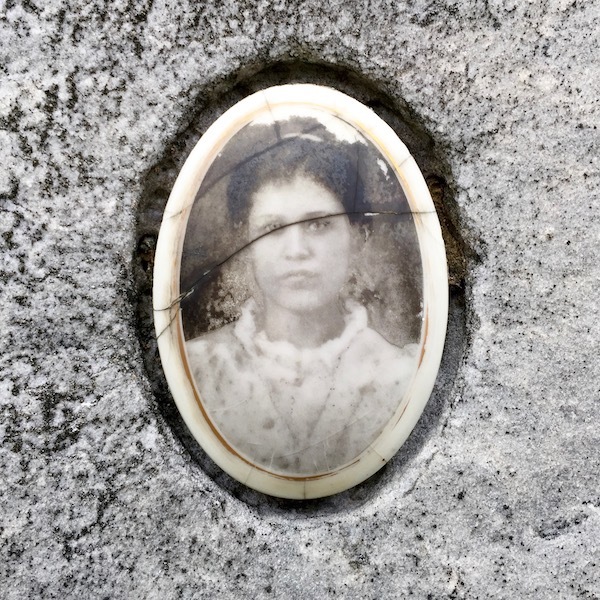 Studying the cemetery is like anything else where we see changes in culture reflected over time. 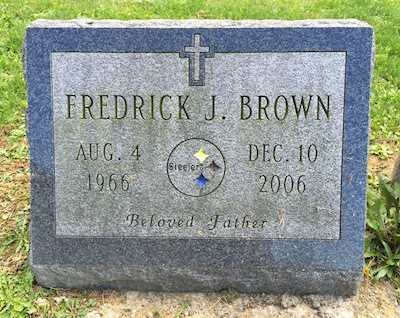 In many ways, future generations will know more about us now from these Steeler graves (as well as the other custom designs and embedded images) than we can derive from their much more opulent 19th century ancestors. At least, they’ll know we (Pittsburgh) sure liked football. On that, they’ll be correct. * Coming across the occasional stone with no death date is always intriguing. We assume these are just folks who plan farther ahead than Orbit staff, but you never know. ** You’ll note that all photos are from graves dating from 2002 onward. 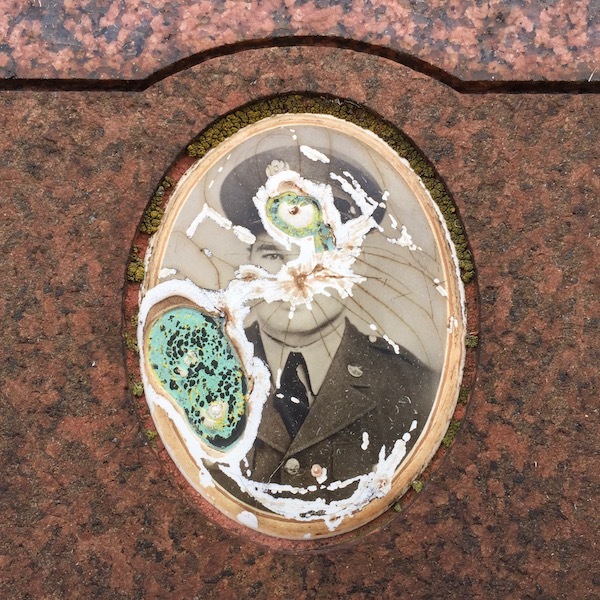 We don’t know when monument makers began offering these kind of options, but almost all of the custom personal interest imagery seems to come from the 1990s-present.